Edda got sent home from school today. Generally she's been doing a lot better, lots of smiles and laughter which has made the rest of us happy too. But I think she caught the bug that Jeremy's had for the past few days - no fever, just a little touch of hoarseness in her voice. We are getting ready to celebrate her birthday with our 2nd annual pancake breakfast. Emy helped us make the invitations. We are trying to get 100 people to stop by the house. Kiki! We got your postcard and we are sending you some snow! Jeremy in his new outfit procured from Sears. Black shirt and orange pants - this photo does not do it justice, really. Crazy. Who is this guy? Got a million compliments from his co-workers. Now to just get glasses from Warby Parker. Edda is not one to refuse ice cream. Boys and their video games. Popped into the kitchen for brownies. Well, tax time is coming. With 3 years of absence due to our overseas assignments, I came back to use turbo tax. I just bought a copy for "home and business". I also downloaded all tax information from our banks and financial institutions today - sorting them out and ready to go. Vince is off camping this weekend. I'm trying to figure out how my camera works with not much luck. A quiet weekend planned - full of work, studying, errands and laundry. I love doing the morning carpool when I have a full, full van. I feel silly when I have only Vince - like I'm wasting gas. All these crazy kids could walk to school - I think it's about a mile. Our household computer system is a little broken. Everything works - kind of. Jeremy's starting to be a little obsessed with trying to fix it. He's up past his bedtime trying to figure out the configuration of the wireless network. I'm listening to a lot of talk about routers. This past weekend I also took a look at the kitchen sink and a bunch of the piping is corroded because I let the leak go on a little too long, so I might have to replace the whole faucet. I didn't take it apart because once I start, there is really no way to stop because we can't really have the kitchen sink not work for weeks while I dither around trying to figure out what to buy at Home Depot. So in the next few weeks, the internet in the house might go down as well as the kitchen sink. Our productivity might take a dive. Really, I'm just going on and on about the wireless and the kitchen sink because I think Edda's back on her crying jag. After a year or so of being so wonderfully and blissfully happy - just laughing and smiling at everything we did - Edda seems to be back to crying for entire afternoons. We try to do for her all the things she loves, Jeremy cooks and feeds her all her favorite things. I think she's tired and I try to put her to bed all hours of the day. Nat takes her out in the snowy weather for a walk and some fresh air. We set up three screens for her, a TV, an iPhone and and iPad all showing different shows that she loves. We give her Tylenol or Motrin when we've run out of ideas. Nothing works. And it's incredibly sad and frustrating to hear her cry and cry for a long, long time. But then after a few hours, she seems to calm down and be fine. I'm a little resigned that it's another mood that will be unknowable and unsolvable that will last for months. Jeremy thinks her mood will only last for today and that tomorrow is a new day and maybe it'll be a great day for Edda. Thursday, when we were all snowed in, we invited the neighbors on both sides over for lunch. Both sets of neighbors moved in after we arrived in 2008 and we've been meaning to have them over for a long time. Since everyone was home with nowhere to go, a Thursday lunch seemed like a good idea. Jeremy made soup from ingredients in the pantry - hatch chili/corn soup and chicken tortilla soup. What's the best way to celebrate Valentine's Day? Have a wedding! Champagne, hugs and kisses at 10:30 am. To a lifetime of happiness Eliana and PJ! Lots of snow here. School cancelled today and tomorrow. There might have been hours of shoveling. I hear there is more snow tonight. And maybe tomorrow night too. But the patent office in my bedroom stays open in inclement weather. So the snow is coming tonight. Some weather models are forcasting 12-18 inches. Kids are gleeful. I'm a little winter weary. I hope we have enough toilet paper. Nat and the kids made valentines for Edda's class yesterday afternoon. Vince is a little disappointed that he no longer has parties in middle school - so he wants to go to Edda's party. Saved my pennies and bought myself a full-frame camera. Such a relief for a 28mm to really be a 28mm - look how close I can get to Vince's face. I've been forever suffering from having lenses that are not wide enough. And - really nice performance at ISO 1250. So many focus points and I don't yet know how to choose the one I want. I just hope that I didn't catch the DSLR as they become obsolete. As everyone heads to their cell phone cameras - I go the opposite direction. Rena & I just came back from our Costa Rica's 5-day trip. It was very good and we enjoyed it very much. With a flourishing tourism, I guess the local people has not benefited from it as they should be. This is going to be a huge problem in the long run. The tourism only drives up prices for everything for the locals. Having said that, probably, Costa Rica is still a better place than those other countries on the other side of our southern border. In my views, globalization is killing every possible opportunity for upward mobility for most people in the world, including us. Look, everywhere in the world, rich gets more $$$ and poor gets less necessity. The gap is increasing in such an alarming rate and its slowing down is not in sight - there is no light yet on the other side of the tunnel. Eliana, our 2nd au pair, is back from Colombia and is marrying her American boyfriend on Friday (Valentine's Day! Very romantic.) We met him for the first time on Sunday at lunch. He's a nice guy sweet and talkative. Plays a lot of football, yet knows how to put fondant on a layered cake. A man of many talents. I'm excited to be Eliana's witness at her wedding on Friday. Actually, I'm honored that I get to go and do this for Eliana - all these girls are like family to me. I wish her a lifetime of happiness and good fortune! Spending Saturday night trying to melt a block of ice from the inside of the fridge with a hairdryer. Exciting! Edda's been mad all day. We aren't really sure why. She's really happy when she's sitting on the potty. I don't really want to admit how many hours she has been on the potty today. It's not fun hearing her cry all day. Jeremy thinks she's a little under the weather. We've given her Motrin and Tylenol - hopefully it's just a passing thing. We tried to watch Ghostbusters with Vince tonight (I'd never seen it before & Edda was on the potty). We made it about 2/3 of the way through when he declared that it was too scary to watch. He's kind of a sensitive boy. Jeremy's taking over the laundry duties from me. Apparently, I'm not very timely with the folding and therefore the dogs sleep on the clean pile and then the clean laundry ends up all wrinkled and covered with dog hair. I don't really have a problem with that, but I think Jeremy does. Second week of nursing school is done! This semester is fun! Lots of hands on stuff (only on fake people though). Sunday night dinner did include the Super Bowl with all the traditional foods. We drove 4 hours from Fort Lauderdale to Orlando because one kid from Hong Kong would like to visit Disney World. I can not believe that they (the rest of the team) spent half day yesterday shopping yet they still had the energy to shop all day today. I sat there besides those stuffs they bought and felt pretty helpless boring and hopeless. 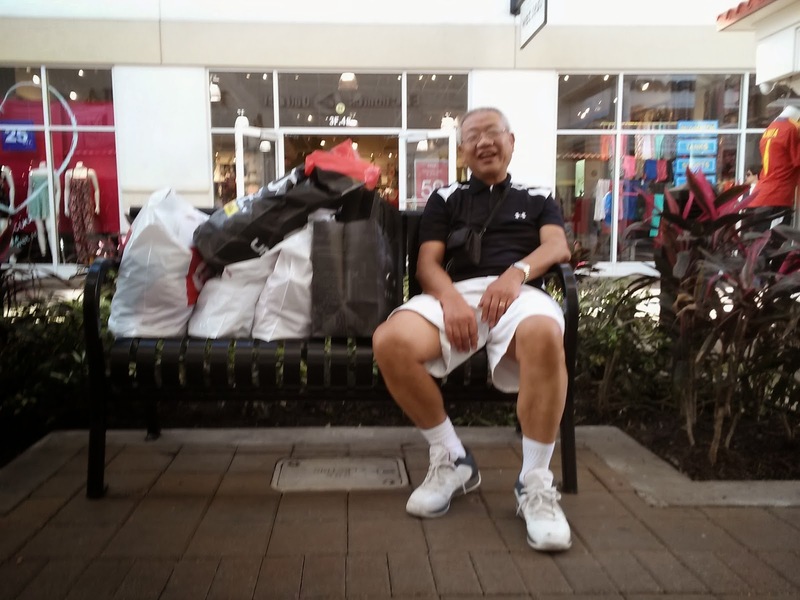 While sitting there, shopping wasn't over yet. Janos came Friday night for a trombone audition this weekend. It's been nice to hear trombone practice wafting out from the basement guest room. I don't often get to hear trombone played except from 4th graders in an elementary school band, so it's a treat. He tried blowing helium through his trombone. Apparently it does change the pitch just like it does with your voice. Jeremy and I were a little nervous that he was blowing helium through the trombone the night before a big audition, but Janos seemed pleased with the experiment. Saturday saw Sophie and her daughter who has Rett Syndrome for lunch. Her daughter, who is 2.5 years old, was in a great, happy mood for a couple of hours and then turned on a dime and went into inconsolable crying for about 45 minutes. I had forgotten, or blocked out, all the inconsolable crying that Edda did at that age, all hours of the day and night for 2-3 hours at a time. I tried to tell Sophie that, for most girls, the crying does end - it does take a couple of years. And I held and rocked her daughter for 20 minutes or so knowing full well that whatever I did, it probably wouldn't work to soothe her. And 45 min after she started, the terrible mood ended and all was well. Today, brunch with some of my favorite people. We look pretty good for being tired moms. Brothers who all have a sister with Rett Syndrome. I don't think they ever talk to each other about their special needs sisters, but they love talking to each other.